ESL Interactive, Classroom Games, ESL Vocabulary, Grammar Games Online, Wheel of Fortune Games, Car Racing Rally Games, Jeopardy Games, High Energy Fun Games for Teaching English, Practice and Play, Games to Energize your Classroom Teaching, Educational Games, ESL Classroom Activities, ESL Classroom Practice Activities, Interactive Games for ESL, EFL Teaching, Team Games for ESL Teaching, Games for Teaching English, Games for Interactive Whiteboards, English Fun Activities for Classroom Teaching, Games for ESL Kids, Sentence Games, Word Games, Vocabulary Games, Grammar Games and more. 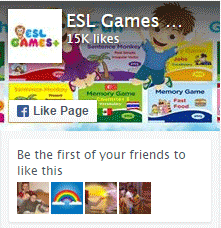 Practice Vocabulary Related to Action Verbs, Colors, Numbers, with this ESL Game. Practice Action Verbs with the Present Progressive with this ESL Fun Game. Practice Bathroom vocabulary with this ESL Fun Game. Have fun learning now. Practice Bedroom vocabulary with this ESL Fun Game. Have fun teaching now. Body Parts Vocabulary ESL Game to review words related to the human body.